When it is heard people talking about fritters in Mexico, is synonym of party . Whenever the month of September is approaching, the families begin to dust off the cookbook to prepare those dishes that are very traditional of those dates – among them the fritters that can also be found in fairs, holidays, parades, celebrations, christmas eve, etc. The reality about this dessert is that it comes from Spain, from the Morisco culture and it has been adopted by many countries, mainly in Latin America – where each country prepares it according to their traditions . 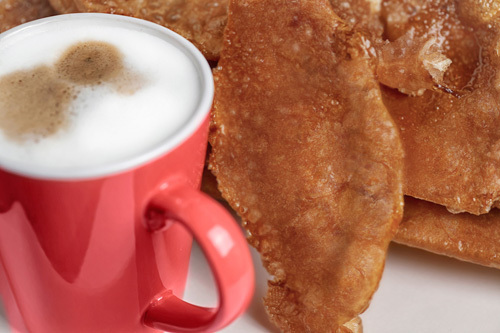 In the case of Mexico, the fritters can be considered as sweet tortillas since they are dough discs that are crispy, light, cinnamon flavored and very tasty . Although the best of the fritters is that they cannot be eaten alone. They have to be accompanied with a tasty champurrado. It is a perfect combination! *It is very curious that these fritters are also known as “knee fritters". This is due to the Mexican grandmothers that worked the fritter dough on their knees. This recipe is laborious, therefore you will have to work a lot. In this recipe the fritters are fried and don’t use olive oil because it is not adequate for frying dough. The fritters are covered with white sugar but brown sugar could also be used. To prepare the fritters vanilla is used and it really has to be used because it makes a big difference. The total preparation time is of 1 hour , since the dough is left resting for a long time. This recipe is for about 12 fritters. Sift over a bowl 1½ cups of wheat flour, with a strainer. Mix all the bowl ingredients with the hands, until an homogeneous mixture is obtained. Pour in the bowl, in intervals, approximately 3/4 cups of warm water (6.3 fl oz) while you work the dough with the hands, until it has a soft texture and an elastic and firm consistency. If you want to be too precise, the dough balls should weigh about 1.4 oz. Rotate the dough disc 45º clockwise and knead with the rolling pin back and forth, until the dough is thinner. Once again rotate the dough disc 45º clockwise and knead with the rolling pin back and forth, until having the form of a circle. Then set aside. In order for your fritters to have the best consistency, the dough discs must be as thin as possible without having dough breaks. Heat the frying pan oil over medium heat. It is very important that the frying pan heat is not too high because the fritters would burn immediately. Take with some tongs 1 dough disc, dip it in the frying pan oil and fry it for about 15 seconds per each side, until it is moderately fried. Transfer from the frying pan to some paper towels, with the tongs, the fritter so it dries and the fat excess is absorbed; then reserve. Repeat the same procedure with the dough discs that were not fried, it won’t be necessary to add more vegetable oil in the frying pan. If the cinnamon and the sugar are added well in advance the fritters’ consistency will ruin. Variation: The fritters can also be prepared in the wind version. Did you like the Fritters? You will need a good rolling pin like the Farberware so your fritters come out really thin. The “Chef Craft Tongs" will help you perfectly well to fry and turn the fritters. If you need baking powder the Royal is the best.